combined in savory, natural and healthy blends. the 6th one is on the house. Talita jams, chutneys and relish are healthy gourmet products, prepared with no additives, colorings or preservatives, no industrial equipment, robots or sophisticated machines. Just fresh fruits and vegetables, a pinch or sugar and carefully chosen spices, well blended in delicious and surprising combinations. Once tasted, Talita products charm you with their exquisite taste and the quality of being natural and healthy. And after satisfying your apetite, you think to share with others the joy of a delightful gastronomic moment. 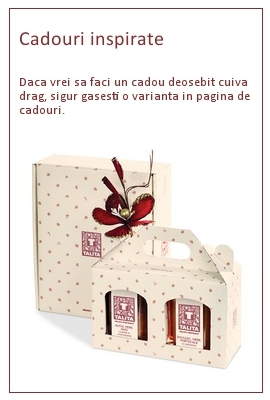 That is why we prepared special gift boxes in which you can pick your own combinations of Talita assortments. We also added a selection of other high quality gourmet products which, together with Talita jams, chutneys and relish, make up special presents, that will be fondly remembered by the ones who receive them. Talita jams are prepared after own recipes, solely from fresh fruits, thermally processed just as much as needed for getting the specific consistency of jams. This way the flavours and textures of the fruits are well preserved, excellently combined with spices, then nicely complemented with walnuts, almonds or pistachio. Relish is one of the most loved local appetizers and is found in the Romanian kitchen in many varieties, made of diverse vegetables and spices. The Talita relish recipe is slightly different from the classical ones, having as main ingredient the celery and a taste well rounded by the red pimiento and the tomato sauce. Chutney is originally an Indian sauce, sweet-and-sour or even spicy, which is being served with main courses based on meat, cheese or rice. The Talita chutneys are prepared after own recipes, that are adapted to European tastes and condimented with local spices. For orders higher than 400 RON.